Neoantigen-based cancer vaccines represent new, truly personalized therapeutic approaches to treating cancer. 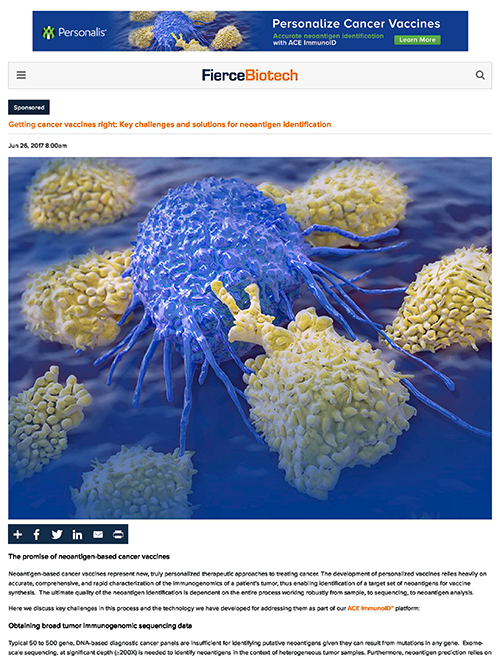 The development of personalized vaccines relies heavily on accurate, comprehensive, and rapid characterization of the immunogenomics of a patient’s tumor, thus enabling identification of a target set of neoantigens for vaccine synthesis. The ultimate quality of the neoantigen identification is dependent on the entire process working robustly from sample, to sequencing, to neoantigen analysis. Here we discuss key challenges in this process and the technology we have developed for addressing them as part of our ACE ImmunoID™ platform.